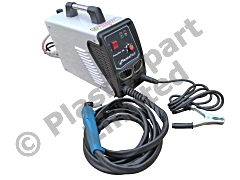 The PlasmaOne Premium 40A plasma cutter is a 240v 40amp machine with serious performance. It will cut 14mm steel plate down to paper thin metal sheet cleanly and quickly. It will also cut stainless, aluminium and other metallic materials easily. High quality reliable inverter power source housed in our latest bodywork with, as for our other machines, real UK backup & spares. Supplied with heavy duty PT 31 torch giving good life expectancy and very low running costs. Reliable HF start system for easy starting. This machine is from our entry level PlasmaOne range and offers a fantastic way into plasma cutting. Despite its amazing price it is extremely well featured and performs very impressively - best of all it's backed up by our solid PlasmaPart return to base warranty and technical expertise. Every machine comes PAT tested and complete with a 12 month commercial use warranty, allowing the unit to be put straight to use in your business or just to give you that extra piece of mind when you are using it at home. Each machine undergoes rigorous testing in our research and development facilities here in the UK before it is dispatched to you - this process takes around an hour per machine. This is the most affordable way to get hold of a good quality, high performance plasma cutter with good quality backup advice and spares. Each machine is supplied with full instructions as well as an information pack - to allow you to get started as quickly as possible and gain the knowledge required very quickly - it is also a useful reference guide to plasma cutting.